While London has no shortage of parks that allow you to pretend you aren't in a sprawling concrete metropolis, there is a place you can go if your taste in horticulture expands slightly beyond your bog standard grass and trees. With 30,000 different species of plants Kew Gardens can be so much more than just a pleasant break from the chaos of the city. This Year Kew Gardens is celebrating its 250th anniversary and if you have never been down before this is as good a time as any because up until the 4th of November visitors can take advantage of a variety of free walking tours. 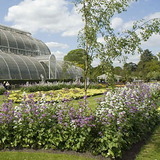 Each tour offers a unique and different perspective on not just the beauty of the botanical gardens and their surroundings but also on Kew's work as a world leader in horticulture and science. If the prospect of seeing plants that come from tropics, eat insects, or even turn into chocolate doesn't excite you there are plenty of other ways to keep occupied at Kew. In the basement of the huge Palm house conservatory there is an aquarium that holds a plethora of exotic species of fish. If you have children one of the popular attractions at Kew is the Climbers and Creepers plant themed play area. Or, you can always swing by Kew Palace the royal homestead of George III. One of Kew's most exciting attractions is the amazing Rhizotron and Xstrata Treetop Walkway that takes you both under the ground and then 18 meters into the air in breathtaking fashion that ensures you will see trees like you have never seen them before. All in all Kew Gardens isn't just a place for pensioners; it is a great place to learn, discover, relax, take the family or go on your own. Kew Gardens can make you forget that you are in a city all together and is sure to give you something to talk about come Monday morning.